Getting a mortgage for real estate in Israel could be confusing and frustrating. Using a mortgage broker like Aaron Morgan will make the mortgage process easier, more affordable and understandable. Here is what you can expect when financing real estate in Israel. It is strongly advised to get approved for a mortgage before signing a purchase contract. As opposed to other countries where a home purchase can be “conditional upon financing”, a purchase contract for a property in Israel is considered final once the purchase contract is signed. It is also important to note that a bank will approve a borrower based on a percentage of the appraised value of a property. Appraisers will often undervalue properties. For this reason, it is often recommended to have a property appraised before signing a purchase contract in order to determine exactly how much money the mortgage bank is willing to lend. Lending institutions in Israel generally approve mortgage applications based on a borrower’s income. A borrower’s assets can contribute to the strength of the application, but the income is a much more relevant factor in approving the mortgage. Cosigners and Guarantors (in Israel or abroad) for the mortgage can also be used in the event that the borrower does not have sufficient income. There are a number of mortgages options available. 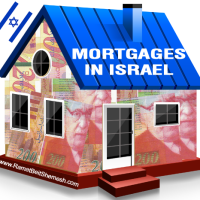 Mortgages can be in Shekels, US Dollars, as well as a number of other currencies. Within each currency, there are a number of mortgage options. The choice of your mortgage should be carefully tailored to match a number of factors, including: The currency of your income, place of residency, economic outlook and economic standing. Mortgages are generally available up to a maximum of 30 years. Comparing and choosing the best mortgage option can be challenging. Many mortgages have hidden costs which can significantly increase the cost of the mortgage. An independent mortgage professional can advise you on the most economical option and help you avoid the hidden traps of the Israeli mortgage system. There are a wide range of fixed and variable options, each with its own advantages and disadvantages. Borrowers need to be cautious to understand these terms as they have different definitions than mortgages abroad. Some mortgage options in Israel have pre-payment penalties in the event that the borrower wants to either prepay the mortgage or sell the property before the mortgage is paid off. Israeli lending institutions will generally lend a maximum of 70% of the price of a property for Israeli citizens. For tourists and foreign buyers, the law limits mortgages to only 50% of the purchase price. Get a Custom Mortgage Quote Today! Aaron Morgan is the Head of Morgan Mortgage and Formerly the Head Analyst and Senior Mortgage Consultant for Mortgage Israel. With additional experience as an actuary, Aaron combines a strong financial background with personable customer service. Aaron made Aliya in 2004 and lives with his wife and 3 children in Ramat Beit Shemesh. Since 2004, Aaron has assisted people in obtaining financing for Israeli real estate. Aaron caters exclusively to the international English speaking market and has worked with all mortgage providers in the Israeli banking system.